Whiteside's Faith Manor offers affordable independent living in an energy-efficient quiet, safe, and clean environment. Our residents are encouraged to become actively involved in creating their own community. Move into a comfortable living situation with amenities and proximity to bus lines. 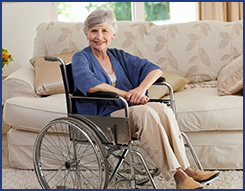 Our one- and two-bedroom, income-based apartments are for senior citizens and the mobility-disabled. These units are federally subsidized by the Department of Housing and Urban Development (HUD). Live peacefully in affordable senior housing. Move into a safe and affordable home. Whiteside's Faith Manor is a building of Section 8 housing units in Chattanooga, Tennessee. We provide housing for senior citizens and disabled individuals in Tennessee and throughout the Southeastern United States. Whether you are looking for low-income apartments or a case manager helping to place a client, learn more about our 117 units and discover our commitment to providing safe and affordable housing to those in need. In 1979, Dr. William H. Whiteside and his wife, Annie Maude, committed themselves to helping others and established The Good Neighbors Club. After years of hard work, this founding organization led to the birth of Whiteside's Faith Manor. Now, our building is a model residential facility for the elderly and handicapped. With the success of our apartment units and our service to the elderly and disabled, we have lived up to our motto, that it is more blessed to give than to receive.